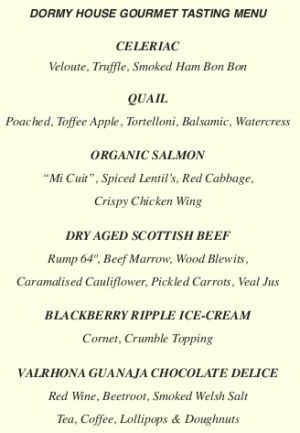 A thought-provoking menu combining sweet and savoury flavours throughout a carefully put together six-course menu will showcase the talent of head chef Andrew Troughton in the Dormy’s Dining Room on October 1, 2009. Local and seasonal produce such as celeriac veloute and poached quail will feature alongside die-hard favourites such as Scottish Beef Rump which will be prepared by cooking in a water bath at 64 degrees for 1 hour. Andrew’s passion for combining surf and turf can be sampled in the organic salmon “mi cuit” served with crispy chicken wing. Herbs from the hotel’s kitchen garden will be used in the menu as well as freshly picked blackberries which will be turned into a crumble ice-cream. Lollipops and doughnuts will finish off what is being hailed by the hotel as a gastronomic night to remember for just £95.00 per head which also includes a Champagne reception and carefully selected fine wines throughout the evening. At sweet sixteen Andrew left school for a trainee post with De Vere Hotels. He quickly moved around the kitchen as a Chef de Partie covering garnish, sauce, larder, starters and salads. Gradually working his way around the Midlands in a variety of venues and positions he arrived at the Dormy House earlier this year as Head Chef in charge of a brigade of 11. He says: “I love the multi tasking involved in working for a hotel like Dormy where you’re juggling wedding banquets, conference dinners and the regular diners”. Regularly spending 14 hours a day in the kitchen, and overseeing 100 covers a day, Andrew has boundless energy reserves. A man for all seasons he loves the lightness the summer menus brings with an abundance of fish. Come the winter he chills out in the long slow cooking techniques. He is very much looking forward to his first game season of the year and presenting gutsy, flavoursome dishes. Chef says: It’s not a job it’s my life”. Braising, poaching, long slow cooking under vacuum and combining recipes based on a surf and turf formula. 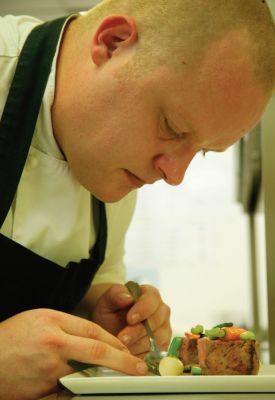 Taking his inspiration from the changing seasons and available local produce, Andrew enjoys evolving different cooking techniques and menus which change every three months. Combination meat and fish signature dishes include Slow Cooked Pork Belly with Lobster and John Dory, Spinach, Oxtail and Cockles. Chef says: “I love the flavours and textures of the decadent mix of surf and turf and thrive on the challenge of using different cuts like chump and shoulder in the same dish”. Spending time recently with John Campbell, Head Chef at the Vineyard, London. Says Chef: “It was a privilege to spend time with a ma n who has earned two Michelin stars and see how the standard is maintained despite the furious pace”. Each menu is carefully balanced to offer a choice of red and white meat, oily fish and a vegetarian option. Regeneration – a technique we use for banqueting – allows us to reduce the service time needed and yet still serve delicious a la carte food to large numbers of diners at the same time. Having a little black book of suppliers.